Since the early sci-fi shows like Star Trek and Lost in Space, readers have CRAVED all things outer-space. That is why National Geographic’s latest picture book, StarTalk With Neil deGrasse Tyson, is sure to be a hit this summer. The gravitational pull begins with the amazing cover — planets, spaceships, stars and color all swirling around famed African American astro-physicist Neil deGrasse Tyson and promising an out-of-this-world experience. 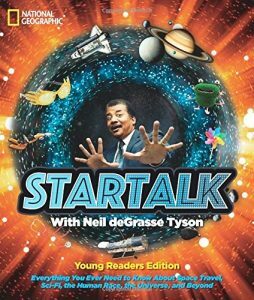 Mr. Tyson explains that StarTalk is a podcast where stars, astronauts, laypersons and the like come together and talk about…well, everything. The book is a type of composite of all the conversations (thus far) that have occurred on the show. 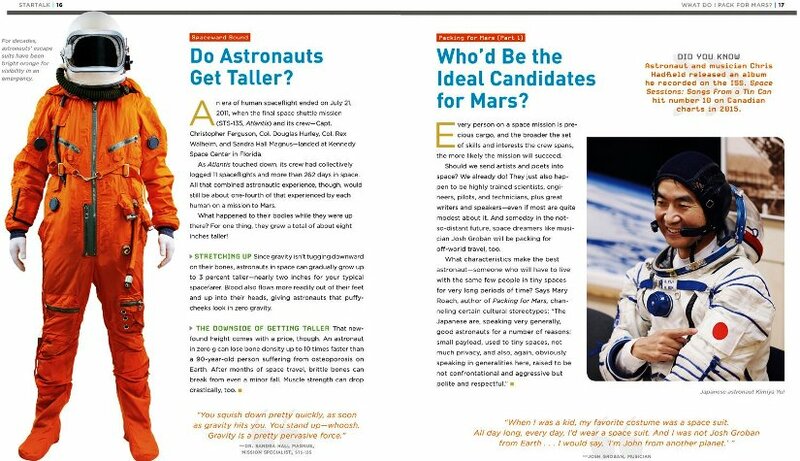 Readers learn that they need an easy-going, polite and long suffering personality to live in cramped quarters with other astronauts over long periods of time. They get to compare the evolution of the space stations, and they learn that astronauts typically grow a few inches when they live in zero gravity for long periods of time. They even learn how the beautiful African American actress, Nichelle Nichols (Lt. Uhura of Star Trek fame) changed the face of NASA and inspired a generation of African Americans to reach for the stars, too. Readers discover what it’s like to use the bathroom in space and why some foods make it onto the astronauts’ menu and some don’t. They study wormholes and get to read a horrifying account (straight from Neil deGrasse Tyson) about what it’s like to be “spaghetti-fied” if you get trapped in a wormhole. They also learn whether it will ever be possible to catch a ride on a comet or asteroid and travel to the stars. This amazing reference book answers some pretty awesome questions, like where the Earth’s heavy metals come from, how Earth gets its water, and whether World War III will be all about water. There are discussions on what causes severe weather, how the Greenhouse Effect works, whether prehistoric sunsets were red (GREAT QUESTION! ), and much, much more. This is a fast-paced and ambitious book about the world around us, our place in it and our impact on it. There is no specific target age, but based on the vocabulary, it should do well with readers from middle grade to high school. Of course, the early elementary ages will enjoy the images even if they cannot follow the vocabulary. Use this book for…well, everything! Jump-start conversations about space, colonizing new planets, stars, black holes, conservation, lifelong learning and more.